Do you like having fun while you workout? If so, then drumming is for you! You will combine drumming and dancing to music that will lift your spirit and de-stress your whole body! 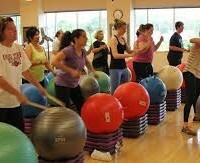 Drums Alive combines movement with the powerful beat and rhythms of drumming for a workout that works your body and your brain. Sticks are available for use or purchase. Class size is limited to 25 Drummers!